The United States of Europe, the new nation formed by an alliance between the Swedish king Gustavus Adolphus and the West Virginians hurled back in time by a cosmic accident—the Ring of Fire—is beset by enemies on all sides. The U.S.E. needs a reliable source of opiates for those wounded in action, as well as other goods not available in Europe. The Prime Minister of the U.S.E., Mike Stearns, sends a mission to the Mughal Empire of India with the aim of securing a trade deal with the Mughal emperor, Shah Jahan. 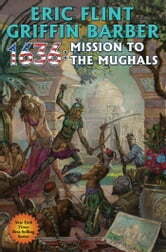 Excellent read, moves along well and incorporates the characters in the ongoing story line, always enjoy a 1635 book.